Happy Thursday, everyone! This week I’ve been sharing a few different outfit ideas for the Fourth of July and this one is probably my favorite one so far! I’m loving the bandana trend right now; it’s the perfect statement piece to add to any outfit! Also, the Fourth of July is hands down one of my favorite holidays of the year! I’d love to hear what some of your favorite traditions are for the holiday. Share in the comments below! Great outfit – love the skirt! This look is gorgeous! I love how it’s a bit different with the big ruffle sleeves and bandana- something special to celebrate the 4th. :) Enjoy! I am loving the gingham top! Something about it makes it look so summery! I’m in love with gingham this season. Such a fun and fresh classic for the 4th too. Your bandana is too cute! I love the contrasting pattern with the gingham. Great look! 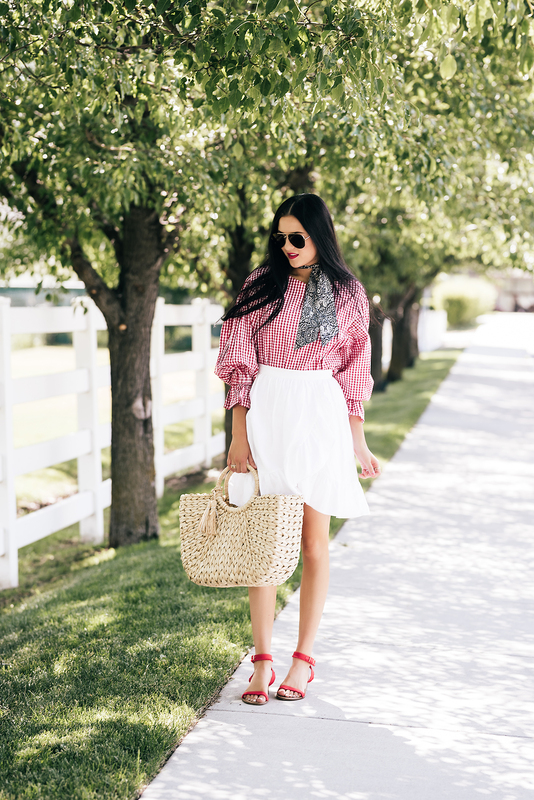 Love the red gingham, so fun for summer! Loving this whole outfit! I agree- love the 4th of July! Those sandals are so cute! Love this whole look! Such a perfect 4th look!! Love the outfit! Perfect for July 4th! 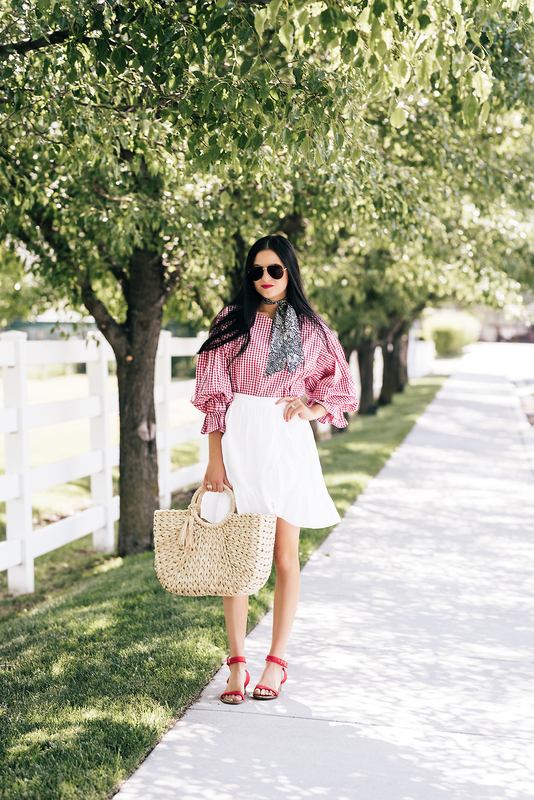 Love that gingham top on you! It’s so much fun and patriotic! 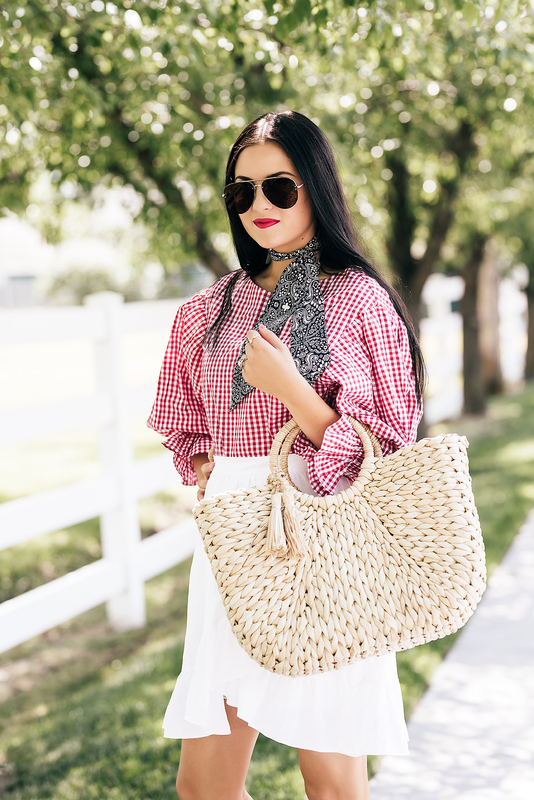 This gingham shirt is so pretty, love how you styled it! Such a beautiful summer outfit! Love ti! Thanks Caitlin! And yes it totally does! I really love that gingham top, Rach! It looks so cute paired with the skirt and perfect for the 4th! I also love how you’ve styled the bandana with the outfit, it’s such a unique touch; I don’t believe I’ve ever seen paisley and gingham combined before! Thanks for sharing and I hope you’re having a great week so far! Such a cute 4th of July day outfit! In love with your top, thanks for the share! Love checking out your blog. You are looking so Parisienne chic here! Beautiful outfit! This outfit is adorable! I NEED that skirt!!! You totally do need it! Oh my goodness this outfit is just so perfect, seriously this red gingham is amazing!! Omg! This top is adorable. I’m dying over these shoes! They are a perfect pop of color!